The tower is in Lower Manhattan, New York City. This modernist skyscraper now stands 1,776 feet high from base to tip, a tribute to the year of America’s independence. It has 104 stories. Construction of One World Trade Center began in 2006 and was completed in 2014. It is used primarily for commercial office space, but will offer some shopping and dining options as well. The tower was built around a thick core which contains elevators, risers, communication systems, stairs and a sprinkler system. The base of the building is equal to the combined footprints of the original Twin Towers. 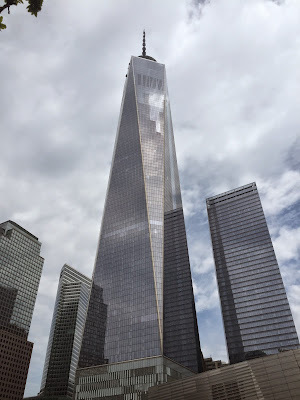 The height of the new tower’s observation decks also matches those on the original WTC Twin Towers. The final height of 1776 feet is reached by adding a 408 foot lighted spire, a salute to the torch held by the Statue of Liberty. The roof is enclosed by a parapet wall, bringing its height to 1,368 feet, the same as the former North Tower. The building will dedicate an emergency stairway to firefighters. I ran the stairs of this building May 17, 2015 and you can read about it here. Click here to see the listing of the tallest building in each of the 50 United States.